The Parish Council is aware of various needs for improvement to right-of-way (RoW) routes through the parish, and their accessibility and condition. The main focus of these developments is currently in the central area of the parish, around (and largely financed by) the Abingworth Meadows development. Thanks for continue to bear with the occasional glitch while all this goes forward – it will be good when it’s done! The RoW routes due to be delivered in this area are set out in the map below. 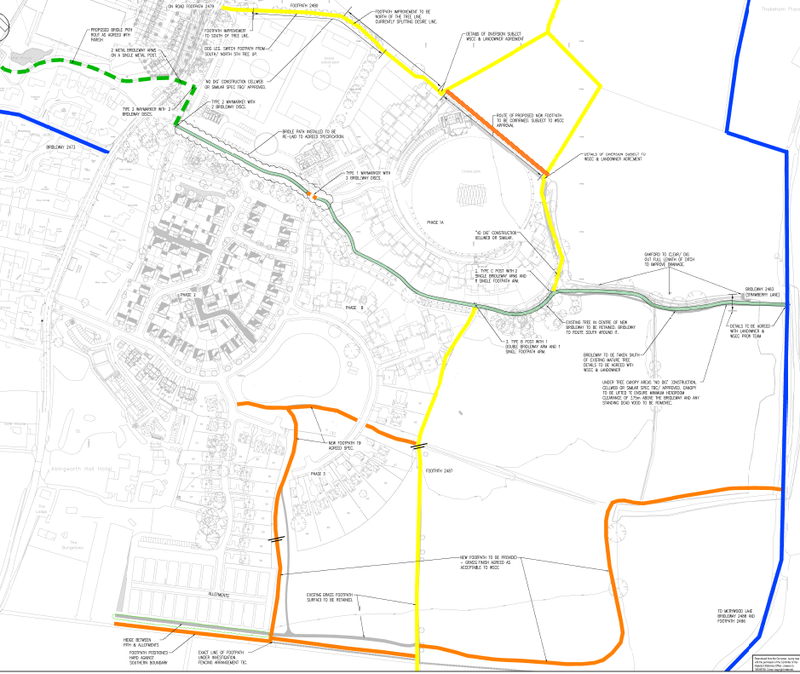 Walkers have gained a new permissive route across the north of the cricket field (in orange) as well as the new east-west bridleway linking Strawberry Lane to the B2139 through the new development. The surface of Strawberry Lane is due to be improved where necessary. As the map shows, there will be other new permissive paths (also orange) and the surfaces of existing footpaths will be brought up to WSCC-set standards. At the north-west of the area, a new further extension of the east-west bridleway will cross the B2139, and run along the north bank of the stream before rejoining High Bar Lane adjacent to the existing playground. 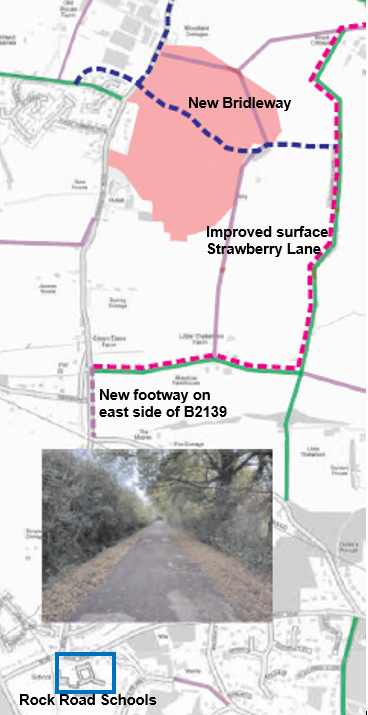 This will allow safer crossing of the B2139 and benefit both residents in the Linfield Copse are and through-travellers along the existing bridleway to West Chiltington. 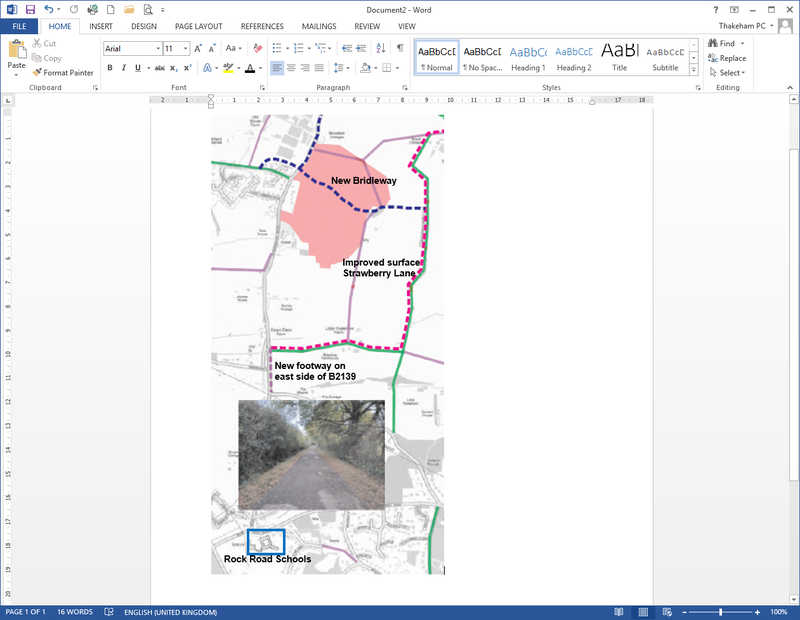 The 2017 move of Thakeham Primary School to the Rock Road site, combined with the fact that the B2139 is extremely dangerous for cyclists, underlined the urgency of creating a new route for children living in central Thakeham to be able to get to and from the Rock Road site on foot, or by cycling, if they and their parents so choose. Within the constraints of limited further funding from the Abingworth development the best solution that the PC and WSCC Rights of Way team could identify is set out in the map below. By summer 2019 the only element still to be put in place will be the new footway on the east side of the B2139; delivery of this is currently projects as spring/summer 2020. If we can find a way to bring this forward, we will.